Oklahoma has experienced a shortage of teachers the past few years, and Carl Albert State College is doing what it can to help solve this problem. The college has 89 students enrolled as Pre-Elementary majors and has recently completed the paperwork to have an active chapter of the Student Oklahoma Education Association. The student program offers members leadership, scholarship, and networking opportunities. 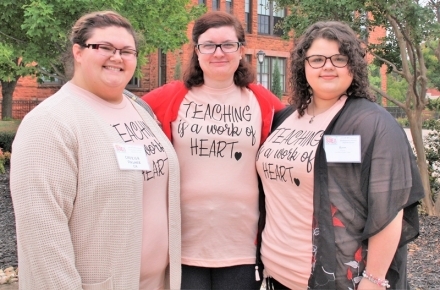 "Our students are receiving an excellent education in the classroom; SOEA will allow us opportunities outside of the classroom to better equip them for their roles as teachers," said Susan Hill, faculty advisor for the CASC chapter. Members recently elected officers attended a Professional Development day at Sallisaw Schools, and hosted a workshop on how to use drama in the classroom. President Raven Cheney, Secretary Cherish Palmer, member Annabell Jackson, and their advisor participated in the State SOEA Conference on Saturday, September 29, at the University of Central Oklahoma in Edmond. They received updates on Oklahoma education from State Superintendent Joy Hofmeister and OEA Vice-President Katherine Bishop and attended workshops addressing everything from "Special Education in your Regular Classroom" to "Learning from First Year Mistakes." The chapter is currently making plans to host a game night on the CASC main campus, read to Poteau Elementary children during Red Ribbon week, and sponsor a book drive for a local charity. SOEA membership is open to any CASC student who is preparing for a career in education. Individuals can join online at http://okea.org/oea-student-program/soea-program-info or by contacting Susan Hill at 918-657-1472. A $30 annual membership due allows the student to also be a member of OEA and NEA and enjoy the benefits of both.